Can You Really Mail Order Ladybugs? Ladybugs are usually mailed in a mesh bag in a ventilated box and released into gardens for pest control. 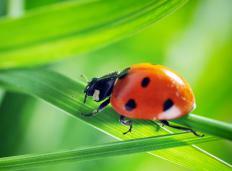 Many garden supply stores offer ladybugs as a form of natural pest control. In addition to physically going to a garden store to purchase the insects, consumers can also order them through the Internet or a mail order catalog service, and the colorful beetles will arrive within a few days, usually in a mesh bag inside of a sturdy ventilated box. The bugs can be released into the garden or used for educational projects, and usually multiple generations will breed from a single order. There are many species in the Coccinellidae family, but the classic ladybug is orange or red with black spots. These bugs are excellent for natural pest control, because they eat aphids, worms, gnats, and other garden insects. In addition, the larvae will also eat garden pests, meaning that even as the older generation is dying off, the younger ones will step in. For gardeners who are trying to garden organically, or want to garden more cheaply, these insects are an excellent way to protect crops and ornamental gardens from infestation. When mail ordering ladybugs, you can order various amounts of them, depending on the size of the garden. A small bag with several hundred bugs is usually quite cheap, but people with large areas to cover can also order several thousand. The cost for a single bag is significantly cheaper than chemical forms of pest control, and typically includes next day shipping so that the insects will arrive healthy. When the box is delivered, it can be taken out into the garden and opened in the evening, along with the mesh bag inside. Most gardeners set the box out for several hours, allowing all of the bugs to get out and explore on their own, although a larger box may be divided up into several sections to ensure that the whole garden is covered. The bugs can also be stored under refrigeration, slowly consuming their own body fat. If a staggered release is planned, a large box can be ordered and broken up into several smaller packages. Keep them in a mesh bag and lightly spritz them with water every two weeks to keep them moist. If well stored and not allowed to get too cold, the bugs can survive for up to three months in the refrigerator and will revive once they are brought outside. Mail order ladybugs are also available for educational uses, usually in much smaller quantities and sometimes with educational tools including a small terrarium for the insects to live in, along with magnifying glasses and an informational pamphlet about them. This can be a fun way to bring nature into a science classroom, especially for young children in urban areas. Many supply companies offer discounts to teachers and other educational professionals as well. Can You Really Mail Order Live Poultry? @orangey03 – I guess so many people have imported ladybugs from other locations that they are overflowing into people's homes! I've seen them in my house during the winter, because they are looking for a warm spot. Have you ever noticed the way a ladybug smells when you touch it? It almost smells like a tomato plant that has been disturbed. This is supposed to deter predators, but it can make your house smell weird if you disturb a group of them. They left my house once warm weather arrived. A few of them died from dehydration because the central heat made the air in my house so dry. I can't believe people actually buy these beetles! I've been wondering how to get rid of ladybugs, because they have become pests in my house. There are several groups of them on my ceiling in nearly every room. I don't know how they got there or why they wanted to be there. I caught a few and released them out in the woods, but they seem to keep coming into my house. If I had a garden, I would put them out there, and maybe they would leave me alone! When I decided to buy ladybugs to go in my tomato garden, I read some interesting information on them. I learned that there is a way to keep them from flying out of your garden once you release them. All you have to do is combine water and sugary soda and put it in a spray bottle. You spray it on the ladybugs, and it glues their wings together. The stuff wears off in a week, but by that time, they will have realized that there is plenty to eat where they are and there is no need to fly somewhere else. This trick kept my ladybugs in my garden. I was astonished when my friend ordered live ladybugs and put them in the refrigerator. I had never heard of doing this before, and I thought it would kill them. A few hours later, I looked in the fridge, and they did indeed appear dead. My friend promised that they would perk back up once we put them in the garden the following month. Amazingly, she was right. The warm sun on their backs woke them up from a long slumber. Raising our own ladybugs was a hit with my children. We ordered a kit online and they shipped the habitat with a return mail card. When the season was right, in the early spring, we sent that card back and they mailed the little buggers express. We also did butterflies; that was the kids’ favorite! You received them in little plastic cups as tiny caterpillars. They quadruple in size and make their little cocoons. You then put them in the habitat to emerge. How beautiful they were and it was awesome to see nature so close.